This is my home office, where I do my writing each morning. I go through phases where I hate mornings. Where mornings are The Devil, sent to torment me here on Earth. We wrestle for hours, days, months, and it can feel like a losing battle. My loathing of the sunrise is tied to periods of depression. And I just got through another doozy of those recently, after leaving my seven-year editing job at MLive. I loved that vocation dearly. I loved my co-workers. I loved working in media, improving and sharing the news and features that can help shape us into responsible, compassionate citizens. And I loved coaching other young wordsmiths. Like my colleagues did for me when I was an intern. I left voluntarily, for a good reason, but that didn't make it easier. And so I grieved. And plunged into a spell of depression. Depression looks different for everyone and has a myriad of causes. For me, it was caused by grief. It manifested in my inability to get out of bed before 11 or 12 or to do much of anything besides read and binge-watch Netflix shows. I couldn't envision making plans beyond the immediate moment. That phase lasted for a couple of months. One thing my counselor did to help bring me through depression was to encourage me to set one simple goal for myself each day. The first few times I tried this, the goals were as basic as getting out of bed before noon. Eventually, I progressed to more complex tasks and a greater number of goals each day. Today, I am healthier, five months into my post-MLive life. For this, I give thanks to God, who provided therapy, a patient husband, my cats, exercise, a great church and several supportive friends and family members. I don't want to oversimplify the healing process, because I am still not fully past the lows in some ways. I still have hard days. But nothing like before. On the other side of the worst of it, I have rediscovered my love of mornings. I can't say what came first, the lifting of my depression, or my choice to start getting up for the day when my husband goes to work. Likely, one enabled the other, and vice versa. 1. I love the sound of birdsong outside my office window. 2. I love my fuchsia lava lamp, glurping and borbling quirkily away in that tiny space between my laptop and printer. 3. I love the time I can spend reading Sarah Young's "Jesus Calling" and looking up the relevant Scripture passages before I step into my work day. 4. I love the writing time, oh! the morning writing life. I am beyond thankful to be a part of this calling. I honestly don't know how I would heal from depression if not for my ability to write through it — and to share my insights with you, lovely readers. It is a precious gift, one I hope I never take for granted. What can you choose to love about mornings? Before you dive into the rest of your day, take a minute to ask yourself: Even if I am not a so-called "morning person," what is one thing about this morning for which I can give thanks? If you are struggling with depression, you might be surprised how helpful this kind of self-talk can be. Oh, Rachel, how I appreciate your genuine, thoughtful character. I never cease to be impressed by your honesty, bravery and integrity. Thank you for sharing about this important topic. I am so glad I know you. I am so glad you were blessed by me sharing my story and found something in it that spoke to you. Also, HUGS! You are describing a real and valid struggle that many people face when our employment situation changes or when life throws us a curveball. The sad thing is, it's easy to feel shame or guilt or self-blame for the feelings, over which we have no control. The best we can do is seek help -- be it therapy or medication or both -- and try to reach out to others who are also facing similar struggles. I'm so thankful you shared your story with me. I feel honored! May God continue to walk alongside you as you walk through the depression. Finding things to be grateful for is huge. I know that's difficult for many who suffer from depression, so I'm glad you're able to do that. I think I can speak for all of your friends when I say we're grateful for you, Rachel! Rachel, thank you for this post! I, too, have struggled with depression. Mine was triggered by specific circumstances, but even after those were no longer in play, I needed help to get back on track. For me, it took several months of medicine,BUT the biggest factor in my healing was being in community. Letting people in. And telling myself that it's OK to have a bad day. One bad day does not mean I am falling into a deep dark place. You know? Permission to have an off day without assuming it's the end was huge! Self talk, soul talk, is huge. God lifted me up, and He used His people to do it. I'm SO glad you're loving mornings again, Rachel. Thank you for sharing. Thanks for sharing a piece of your story with me, Jocelyn! I understand about the circumstantial triggers, and also about the definite need for meds at times. I have experienced more severe and lasting bouts with depression in the past -- one time I was depressed for a full year -- and in those phases, I needed medication combined with therapy and support from friends and family. I'm fortunate that this time, it never got to that level of severity, so I was able to opt out of meds and seek therapy as my primary healing source, combined with outreach to friends. Oh yes, you're absolutely right! We are all different, and need different approaches to healing. The great news is, healing is possible. One of the worst things about being depressed, for me, was not realizing that. I'm sure it sounds strange to those who haven't experienced depression, but it's very hard to get past the present moment and imagine a brighter future. At least, it was for me. Exactly! Oh it just breaks my heart! 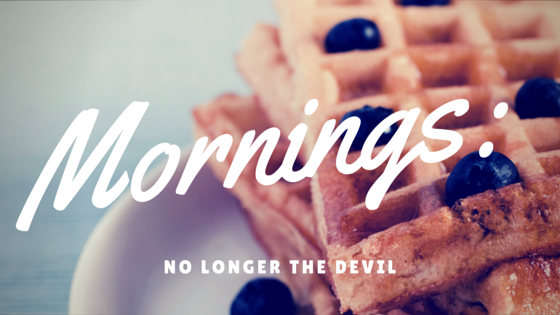 I'm so thankful mornings are not the devil for you anymore. Praying for those still suffering.